I don't teach my kids enough. As in, it's a wonder Isaac knows how to recite his ABC's, but he most certainly doesn't know what each letter looks like! Although we're pretty certain he has a touch of colorblindness, like Tony, the boy just seemed to lock in on his colors. And don't even get me started on Ezra, I'd be embarrassed to tell you how many times I've read a book to him. And then, you have their spiritual development, towards hopefully one day asking Jesus to be their Lord and Savior. Augh, I'm just awful! Prayers before mealtime are consistent between home and daycare, and every evening we do our bed time prayers. We'll also pray when we hear of someone being hurt, ill or when an ambulance passes, but I still don't feel like I'm doing a great job actually weaving those tidbits of my faith into the everyday small moments of their life. Specifically this idea from The True Confessions of Mrs Olson. I was sold! Fun, the Bible, learning and a countdown. I was so fired up, I even laid it out on our google calendar to be sure I didn't forget to start on the right day. 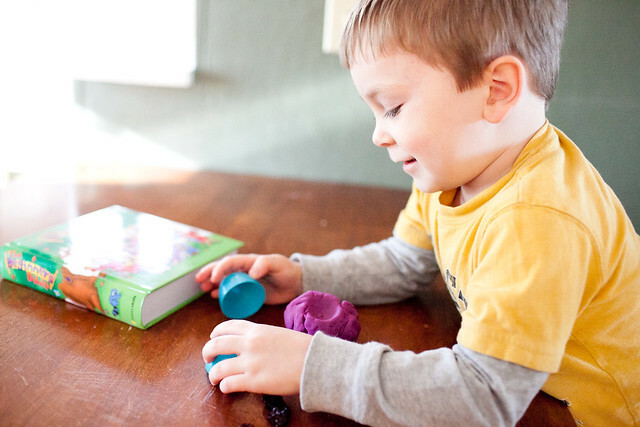 Day 12 :: mini playdoh … “The name of Jesus” Read the story of the Angel coming to Mary in Luke 1. Talk about what the name of Jesus - Immanuel “God with us” means. Talk about the meaning of our own names. Read Philippians 2:10 together and discuss. Use the playdoh to spell out the name of Jesus. Isaac was really excited to see the return of the Easter eggs, even if they were empty and borrowed from my Mom. I didn't let him see all of them, but stuffed some dried cherries in one to bribe his listening ears. 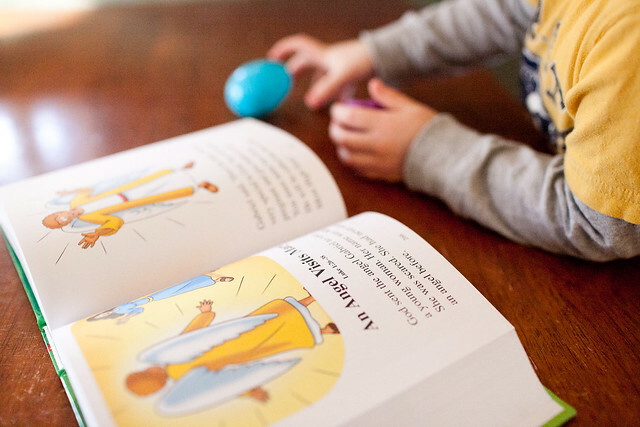 Isaac first thought that Gabriel was Mary and didn't quite understand why Mary would be afraid to have a baby without being pregnant, but he asked some great questions. All while making two monster eyes. Oh, boys. We talked about his name and Jesus' name and how God ordained him to be called Jesus. Only I didn't use the word ordain, because he's not quite three. ;) He seemed to enjoy him and is really excited about today, Day 11's, special treat! 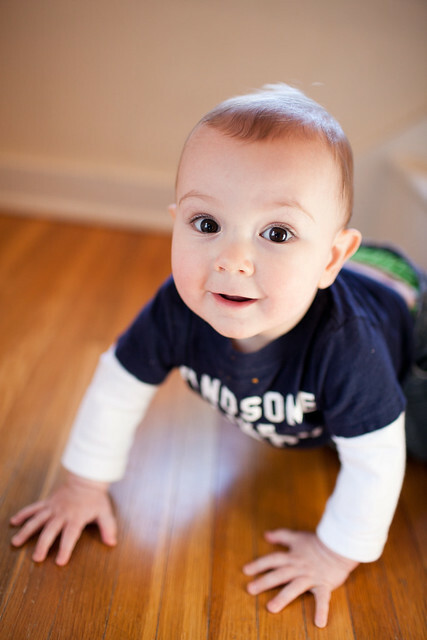 Ezra was intent on climbing the stairs the whole time I was with Isaac. It's a good thing he's so darn cute. I am so excited about this! I am going to round up my supplies and start tomorrow - 10 days is better than nothing, lol. My 5 year old is SO ON FIRE about Jesus right now and with Easter coming I was looking for a way to keep it all about Him. Very cool. 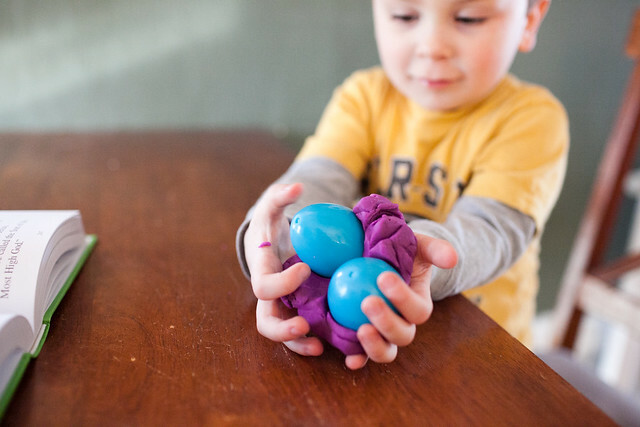 We usually do a craft or two centered around each holiday, and I've been thinking lately about what sort of egg activities to do with Cameron. Um, hello Leslie. 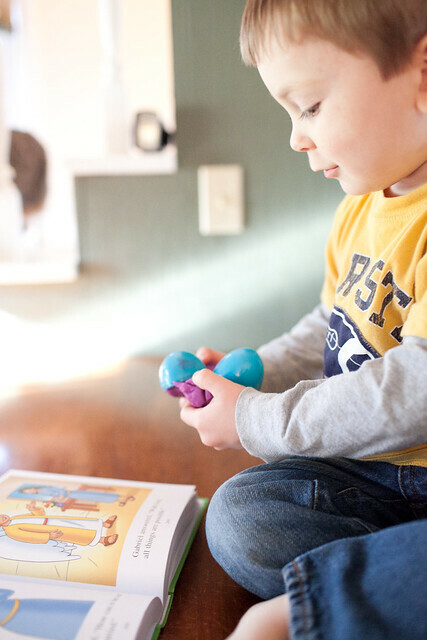 How about teaching him the true meaning of Easter? I recall making a cross, grave and tombstone in a shoebox when I was little- and I think something like that is right up Cameron's alley. I agree, though, it's hard to communicate and answer questions about Jesus when our children haven't seen him face to face yet! When I taught Sunday School, my kiddos always made little monsters and snakes and pizza and snowmen out of their playdough when we were supposed to be making lesson-related things. It was so cute! We hardly go to church (not that I am proud) and dont talk a ton about Jesus (again with the price) but she does go to preschool where they teach about Jesus. She is much more open than I could ever teach her. No matter how little you teach and talk to your kids at this age, know that they absorb it like a sponge. You are doing great!